"...This scares everybody — the fact that we cannot make this well stop flowing." While Obama has recently said that stopping the oil leak is his priority, he has also claimed that job creation and stopping terrorist attacks are his priority. Unfortunately, the country will soon find out that "somethings gotta give." 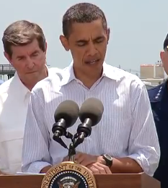 Watch below as Obama discusses the BP oil spill.